My paintings celebrate the power and beauty of domestic spaces and objects. I paint directly from life, in natural light, still life objects which communicate through a window with a landscape, urban or natural. The objects, culled from daily life and painted larger than life, take on a monumental quality as viewed against the landscape, challenging established hierarchies between traditionally male and female spaces. Light is the force which brings to life my otherwise still objects. The same light that describes the form simultaneously destroys it, turning the still life objects into abstract shapes of color and pattern. Gestural brushwork and rich surfaces record the urgency of trying to capture a brief moment in time dictated by the short life span of the flowers and the ephemeral quality of the light. A "sense of place" is a unifying theme of my work painted in situ in locations as diverse as New York City, Rome, and Maine. Most recently the particular space and diffused Northwest light which illuminates my studio and informs my paintings have begun to assert themselves on my work. The still life objects are now juxtaposed against forested land, shipyards on the Willamette River and the distant vista of the Cascade Mountains. The broader skies and simpler compositions have altered the balance, scale and palette in my paintings making my otherwise universal images, specific to the Northwest. 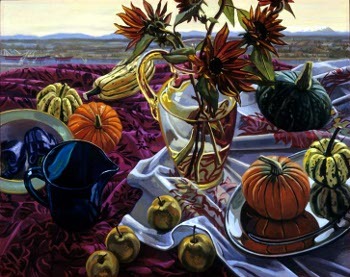 "Sweet Delicata", named for the yellow and green striped squash in the painting, was included in the 1997 "Oregon Biennial", curated by Katherine Kanjo, curator of contemporary art at the Portland Art Museum. The exhibition traveled from Portland Art Museum to the Schneider Museum of Art in Ashland, Oregon, University of Oregon Museum of Art in Eugene, Oregon, and the Willamette University Art Museum in Salem, Oregon. This painting was also chosen for inclusion in both the "Pacific Northwest Annual" at the Bellevue Art Museum in Bellevue, Washington and "True Art; Northwest Biennial" at the Tacoma Art Museum in Tacoma, Washington.